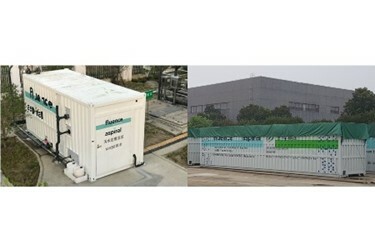 Fluence will supply Aspiral™ Smart Packaged wastewater treatment plants for 13 sites pursuant to these initial contracts. A total of 35 Aspiral™ units (thirty (30) L4 models and five (5) S1 models) will be deployed to handle the varied capacity requirements at the individual sites. This will be Fluence’s first sale of the S1 type, a small-scale Aspiral™ model. The 20-foot S1 units will each be used to treat up to 75 m3/day of wastewater at five separate toll stations in Honghu and Huangshi City. The 40-foot L4 units, which can treat up to 200 m3/day, will be distributed among 2 parking areas and 3 service areas along the highway in Honghu and Huangshi and 7 service areas along the Hangrui and Huyu highways. Fluence announced its strategic partnership agreement with ITEST in October 2018. Pursuant to the agreement, ITEST intends to promote and implement further Aspiral™ wastewater treatment solutions for its Highway Service Centers in Hubei Province, with annual targets over the next three years.